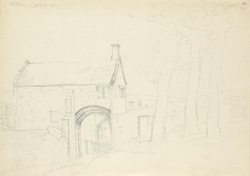 An outline view in pencil of the outer side of the gateway or porter's lodge. The Benedictine Monastery of St Peter, built in the 11th century, was shut down when Henry VIII set about establishing the Church of England by dissolving the monasteries. Some of the buildings had fallen into ruin by Grimm's day and others remained relatively intact.